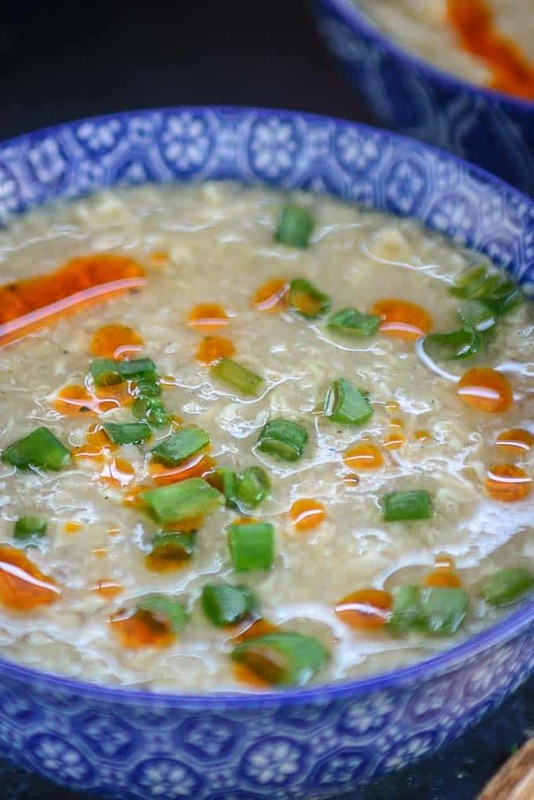 Make this Chinese Egg Drop Soup for a healthy dinner. It’s easy and simple to make and gets ready in under 15 minutes. Add chicken or Shrimp to make KETO version. Here is how to make Egg Drop Soup Recipe. 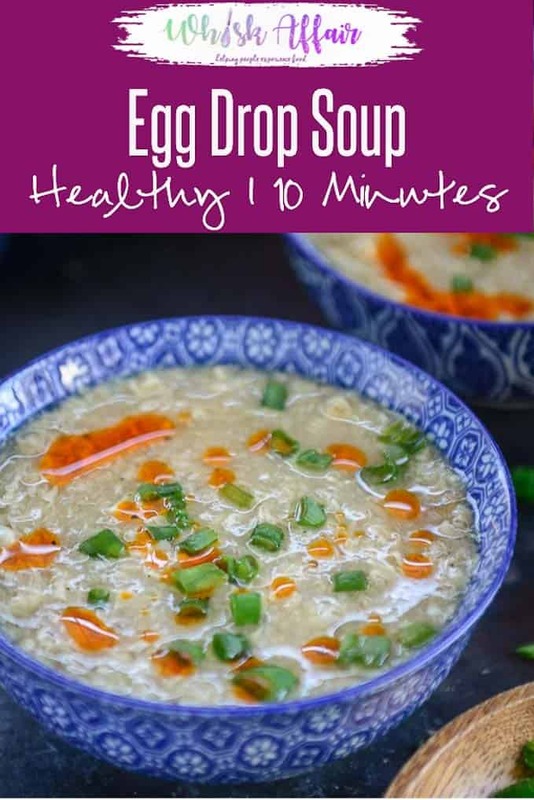 Make this simple yet healthy egg drop soup today. It is so satisfying and delectable that you will find comfort every spoon of it. 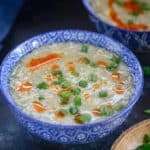 I am sure you are going to love this authentic, restaurant-style egg drop soup and won’t have to frequent the Chinese places next door. This is honestly the best soup recipe that you can put your hands on and takes only 15 mins to make. This homemade goodness is rich and flavorful. You are going to need a good quality chicken or vegetable stock, a little cornflour, garlic powder, soy sauce, vinegar, black pepper powder, eggs, egg white, salt, red chilli oil, and spring onion greens. Let’s make egg drop soup today and get you a bowl of comfort. “Egg drop soup is a Chinese delicacy made of beaten eggs in chicken broth, seasoned with black pepper. Egg drop soup, also called egg flower soup, is a Chinese soup of wispy beaten eggs in boiled chicken broth. Condiments such as black pepper or white pepper, and finely chopped scallions and tofu are optional, but commonly added to the soup. The soup is finished by adding a thin stream of beaten eggs to the boiling broth in the final moments of cooking, creating thin, silken strands or flakes of cooked egg that float in the soup. This Egg drop soup is low on calories and makes for good appetiser. After putting the ingredients in the calories counter, I got 143 calories per serving of this soup. Eggs: We are going to need 2 egg and 1 more egg white to get the luscious silken strands in the soup, that’s why egg drop soup. Use large and fresh eggs to make this soup. Chicken broth: I have used chicken broth to make this egg drop soup, as traditionally chicken broth is used. You can use vegetable broth if you wish to. Cornflour: You will need a little cornflour to thicken your soup. It depends on how you prefer your soups. If you like your soup to be thick, use cornflour. You can leave it out if you like thin soups. Seasoning: I used black pepper powder, garlic powder, soy sauce, vinegar and red chilli oil. These lend the heat that you need in your soup. Spring onion greens: Spring onion greens add a beautiful flavor and are a requisite for Chinese food. Add them as garnish to your soup and get a little crunch. You can make many variations of this soup. You can add wontons, add chicken pieces to it or shredded chicken, corn, noodles, spinach or you can even make ramen this way. For a Keto version, skip corn flour and you can add shredded chicken if you want. It is easier to make this soup gluten free. Just replace the soy sauce with Tamari. All the other ingredients used in this soup are gluten free. Now that you know how easy it is to make egg drop soup at home and what a comfort it is served in a bowl, what are you waiting for? Let’s get started and make this egg drop soup. Get all the ingredients mentioned for the soup out and keep on your countertop. It is going to save you a lot of time and will make things easier. To make this egg drop soup, you will need four cups of chicken stock. First, make a slurry with cornflour and water. Mix cornflour with 1/4 cup of water to make a lump free slurry. Take a pan and add chicken stock, cornflour mixture, soy sauce, vinegar, garlic powder and black pepper powder. To this, add the cornflour water mix. Mix properly and keep on stove. Heat until the mixture starts to boil. Stir occasionally to avoid any lump formation. Make sure you properly mix the cornflour slurry to the broth mix to avoid any lumps. While your broth is boiling, whisk eggs and egg white in a bowl. Now remove the pan from heat and slowly stir in the eggs. Slowly pour the egg in the broth whisking continuously to create egg ribbons. Add salt and mix well. Garnish with red chilli oil and spring onion greens and serve hot. 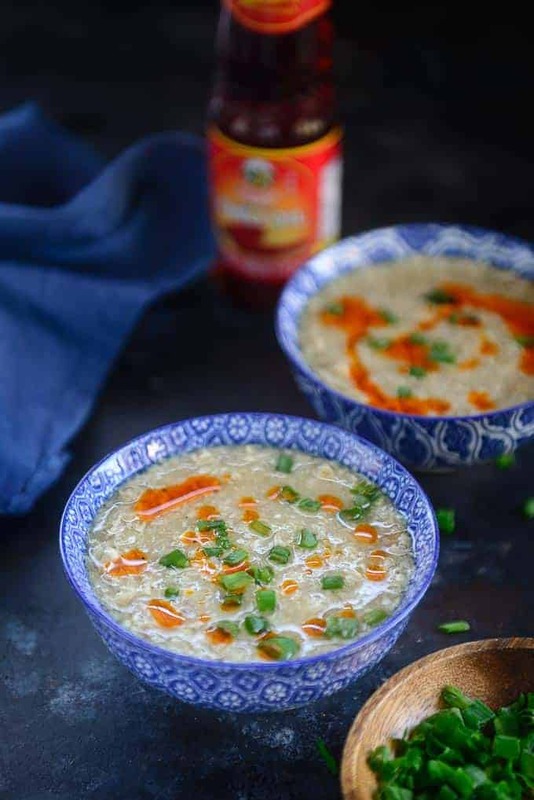 Make this Chinese Egg Drop Soup for a healthy dinner. It's easy and simple to make and gets ready in under 20 minutes. Add chicken or Shrimp to make KETO version. Here is how to make Egg Drop Soup Recipe. Mix cornflour with 1/4 cup of water to make a lump free slurry. Mix chicken stock, cornflour mixture, soy sauce, vinegar, garlic powder and black pepper powder in a pan. Heat until the mixture starts to boil. Whisk eggs and egg white in a bowl. Now very slowly pour the egg in the broth whisking continuously to create egg ribbons. Garnish with red chilli oil and spring onion greens and serve hot.